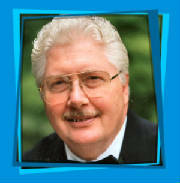 Here's more of Ken's religious links and journey of faith . 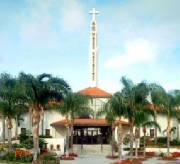 . .
Click on the Coral Ridge Presbyterian Church in Fort Lauderdale where my brother Steve & Pam were married. 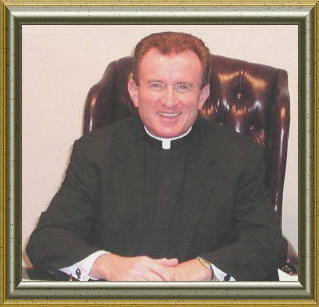 Steve says that Dr. Kennedy speaks directly to God - but when we visit them in Florida, we attend St. Coleman's RC Church up Federal Highway (US 1) a few blocks, because I know that . . .only The Pope talks directly to God. (God Bless Dr. Kennedy - he recently passed away - 1930-2007) Di really liked the Mother Angelica book I gave her for Christmas. She couldn't put it down. Here are some of the other churches we attend . . .
My journey . . . Here are links to some of the churches I attended or visited on my faith journey . . .
Castanea Evangelical United Brethern Church was next door to our house at 15 East Brown Street in Castanea PA, and I attended there for the first 12 years of my life. I remember learning all of the major Bible stories there, but never really developed a relationship with Jesus. I have fond memories of Mrs. Shearer, my Sunday School Teacher, and of her Sloppy Joes!!! The EUB's summer church camp was at Central Oak Heights in West Milton PA. My cousin, Don Smith went to EUB in Jersey Shore, and I went to COH with him for a few years. I remember the song... COH, oh COH, of 1952, we love you . . . and then it was, COH, oh COH, of 1953, we love thee... and so on. Eventually the EUB became United Methodist. When I was about 12 years old, my best friend Jay Frazier, invited me to go to church with them at the First Church of Christ (Disciples) in Lock Haven. Their summer church camp was Sylvan Hills up Marsh Creek in Centre County. I truly felt Jesus' presence at Church of Christ for the first time. It was very rewarding for me there, both spitritually and socially. I played piano for their Youth Fellowship services on Sundays, sang in the Adult Choir, played the pipe organ for services when the organist was on vacation occasionally, joined their Boy Scout Troop #69, and went on their many youth activities, e.g. Carroling, hayrides, horseback riding at Swopes Farm, swimming at the YMCA in Renovo, etc. 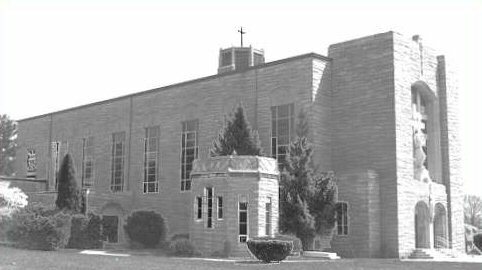 In my teens I experienced several other local churches, Saint Agnes, which I liked a lot, especially the Men's choir at the Midnight Masses on Christmas Eve, the First Baptist Church, the EUB in Lock Haven, which is now the Covenant United Methodist (where I was Baptized as a baby), and the Immaculate Conception RC Church. When I left Lock Haven in 1960, I attended both Catholic and Protestant services in the Navy, and played piano and organ for them sometimes. After the Navy, I eventually moved to Altoona PA and attended the Cavalry Baptist Church on Ruskin Drive, then settled at the Altoona Bible Church Union Boulevard, near our home on Aldrich Avenue. I joined the Hiram Lodge of F&AM in Altoona. From Altoona I moved to the Valley Forge area, and attended several churches there, i.e. Pawling Independent Baptist Church, Baptist Church of Phoenixville, Washington Memorial Chapel at Valley Forge Park, Calvary Bible Church in Phoenixville, Wayne Presbyterian Church, and Calvary Fellowship in Wayne . . . Then, after my divorce, I dated another Catholic girl and started accompanying her to Catholic churches, which renewed my spirituality. When I decided to seek an annulment, I met a Priest at a wedding who invited me to meet with him to discuss the annulment, and I decided to attend RCIA at his parish, Saint Mary of the Assumption in Manayunk, Philadelphia PA. After my conversion, we were married at St. Mary's. Subsequently, I joined our local parish, Saint Francis of Assisi, where I am happily involved to this day. I think what was missing in all of that seeking, was the fullness of the Faith, i.e. all of the rich aspects of the history of Christianity found in the Catholic Church, eg. . . the beauty of all of the Sacrements . . . the Mother that God chose and Jesus loved . 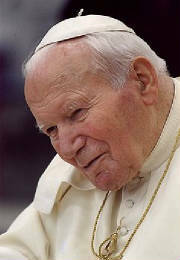 . . the beautiful historic prayers, especially The Rosary . 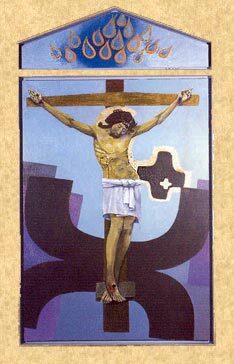 . . and The Stations of the Cross . . . the writings of the early Church Fathers . . . all of the Books of the Catholic Bible . . . the Communion of Saints . . . but most of all . . . the presence of Christ in the Eucharist . . .
Diane and I enjoy visiting other parishes and shrines to enjoy and reflect on the many ways they celebrate their love for Jesus through their various faith practices, relics, art, sculpture, architecture and music - and to honor the Saints in prayer, and learn more of the history of The Church. Some of the parishes and shrines we have visited are . . .